Waikiki is a strange place; I think even the Honolulu Visitor’s Bureau will admit to that. But it serves a purpose and isn’t bad, as long as you combine it with something that is NOT Waikiki. Spending a week there, I had many opportunities to walk around and soak in the odd vibe that is simultaneously both South Pacific and Vegas in flavor. Across the street from the Sheraton, where I spent the week, is a shopping mall, one of about a gazillion in Honolulu, containing stores ranging from Hermes to Louis Vuitton – you know, for the common man. One day, while walking through the mall I kept noticing these signs. At first I didn’t pay much attention to them, but the more I saw them, the more curious I became. I had to investigate. Japanese gun laws are extremely strict; among the most severe in the world. Japanese law states that no one can bear firearms under any circumstance. The only citizens allowed to possess a weapon at any time are police and the military along with those who have a hunting license, which requires a highly restrictive permit. In an odd sociological phenomenon, the combination of these gun laws and the mystique of being in the U.S. turns normally mild mannered Japanese tourists into gun crazed shooters. There are dozens of gun clubs throughout the islands, mostly catering to Japanese tourists, although certainly all are welcome. 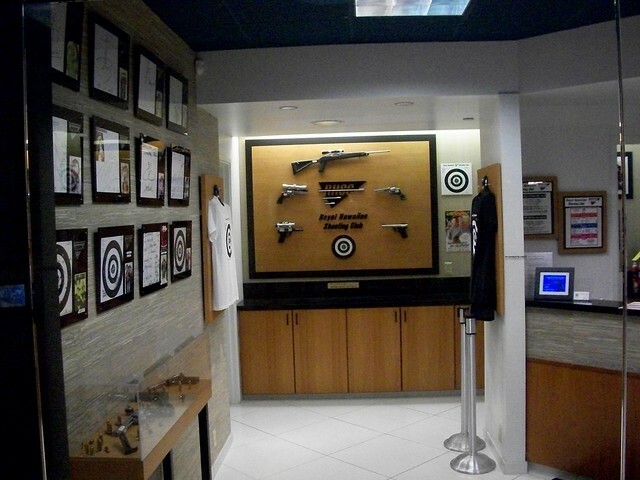 This was a first for me and my fascination over this gun tourism phenomenon is endless. I’m sure these establishments are safe and the shooting harmless, but what exactly is the draw for tourists? To live out Wild West fantasies? Regardless of the impetus, there’s no debating their popularity in Hawaii. On a related note, if you ever want to see what it’s like to shoot *historical* guns (and famous ones like the AK-47), you’re welcome to join Marc and I when we go to the range with our small arsenal. We go once or twice a month, and it’s a lot of fun. Who knew?? Thanks for investigating this interesting, but little-known, Waikiki tourist attraction! Did you ask anyone in the shooting club what the deal was? Coz the answer would be so very interesting. That is so crazy. I live in Vegas, and we have those wonderful “Come shoot an AK-47!” places all over. Who knew they were in Hawaii, too? 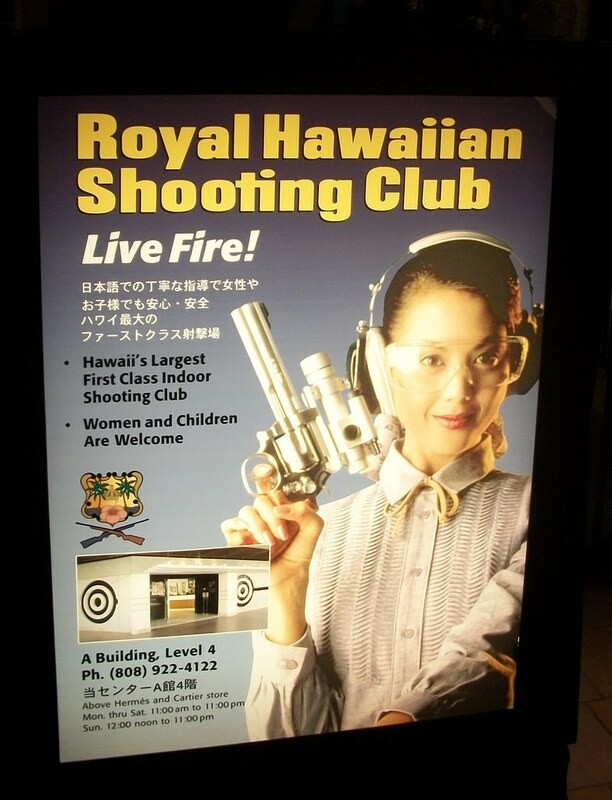 The gun clubs in Waikiki are relatively new. Until maybe 4 years ago I never saw them there. Apparently someone saw an opportunity.